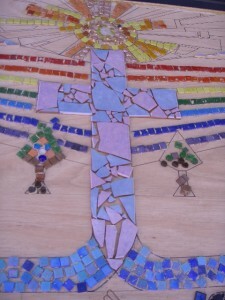 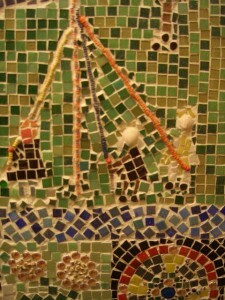 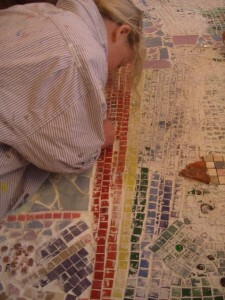 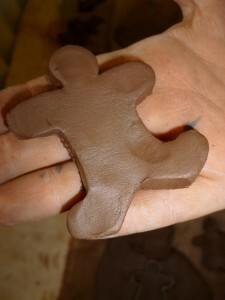 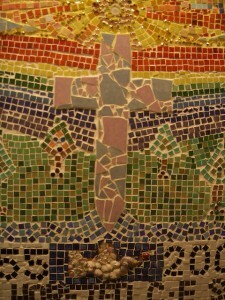 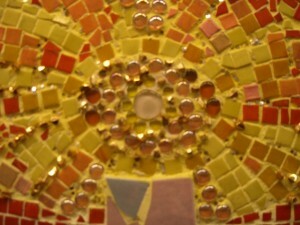 A popular technique for schools and community groups is mosaic making. 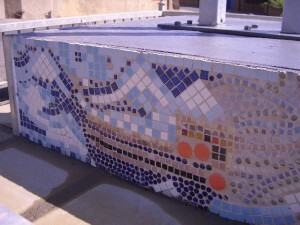 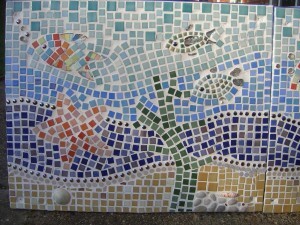 We are able to facilitate small, medium or large groups design and make mosaics. 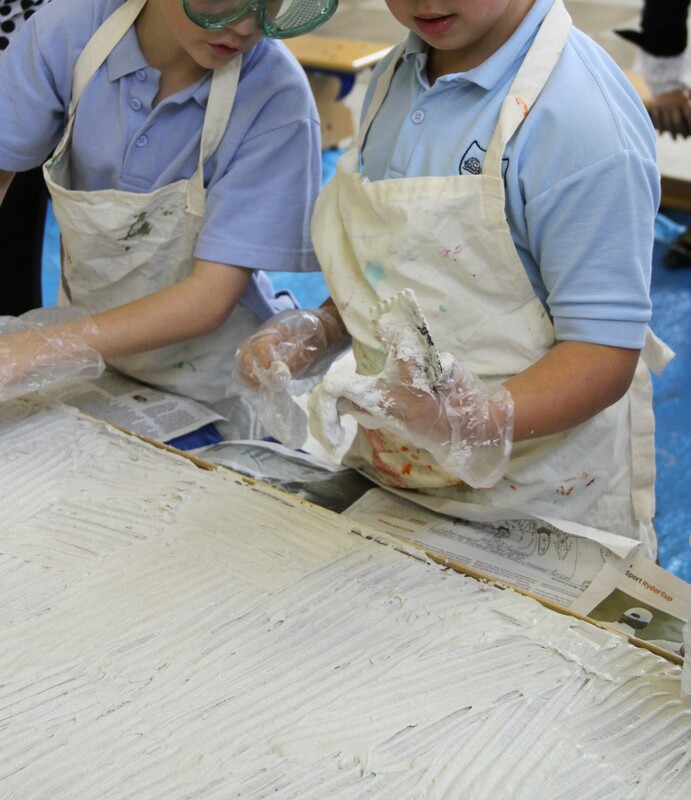 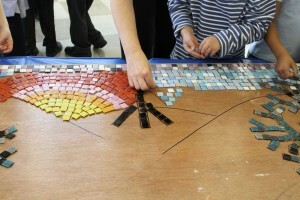 We involve pupils in all stages of the design, laying out tiles, fixing and grouting. 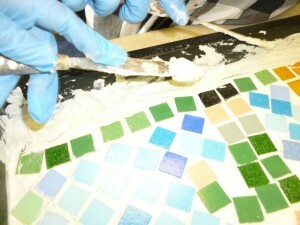 The mosaics are for interior and exterior display. 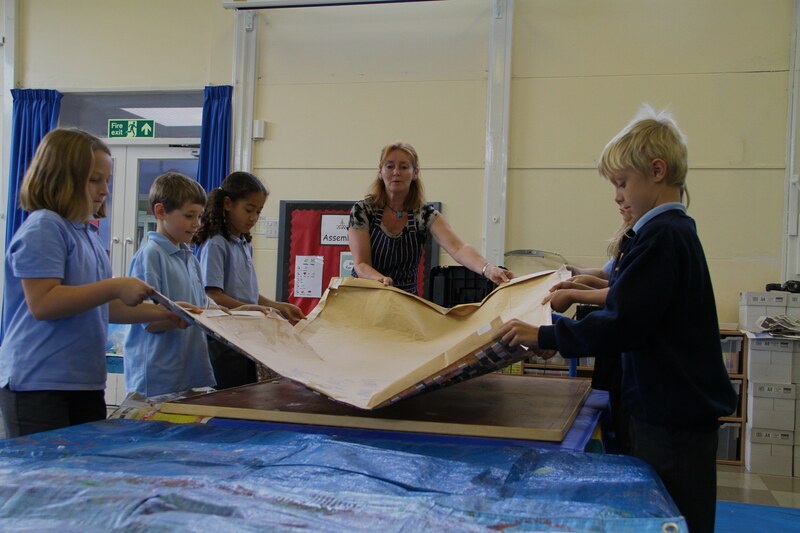 We provide all of the health and safety equipment and advise you about what you will need to make long lasting works of art. 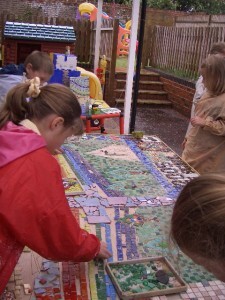 Many projects involve the wider community as well. 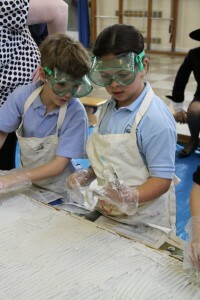 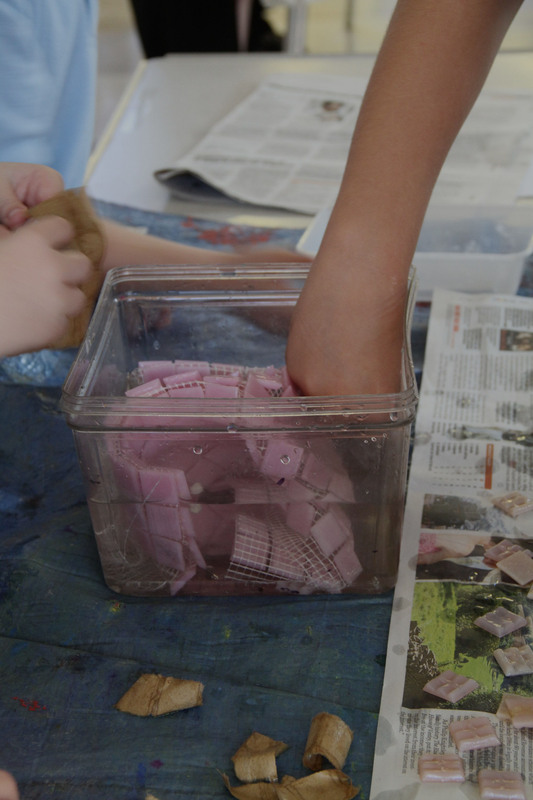 We bring history, science, maths and art and design into the learning process. 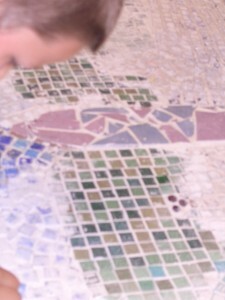 This page contains example from a wide range of mosaic projetcs facilitated by Art Techniques. 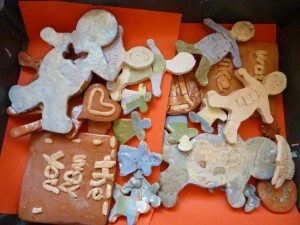 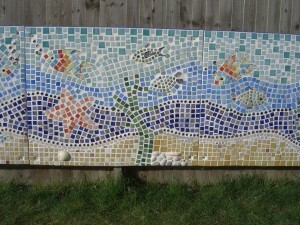 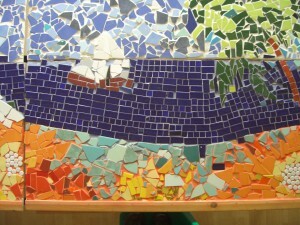 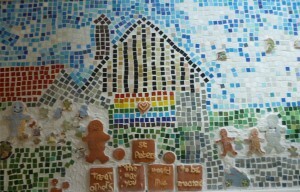 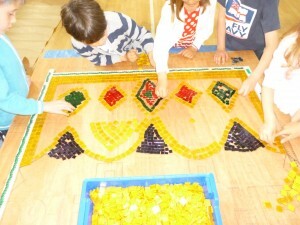 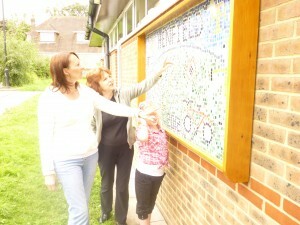 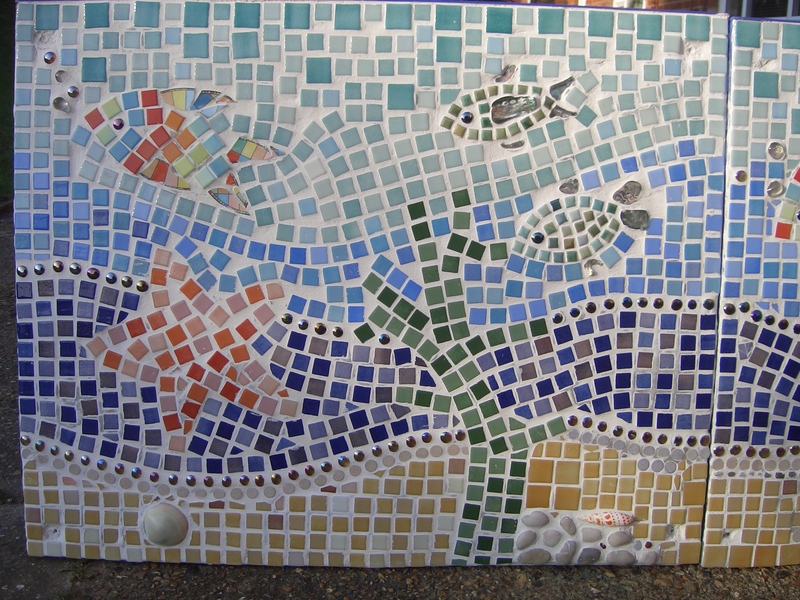 Henfield Primary School West Sussex Community Mosaic Project 2012. 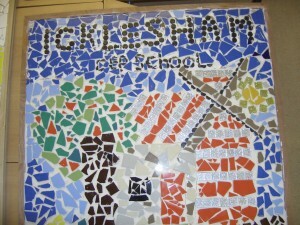 This project was planned to bring the school and the village community together. 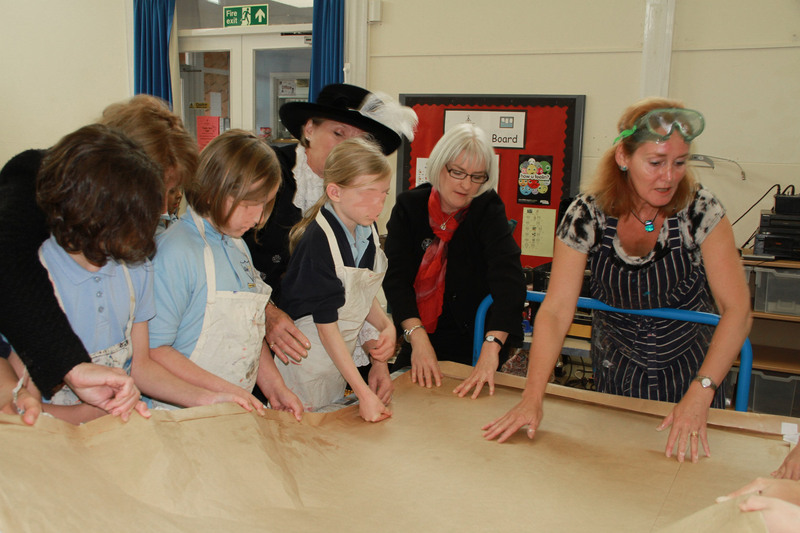 A wide range of village based sessions were planned and delivered. 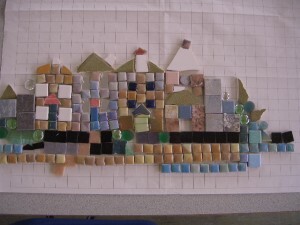 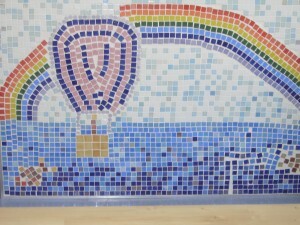 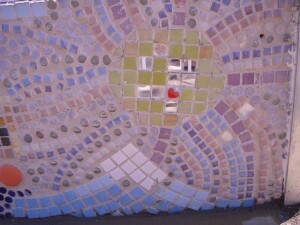 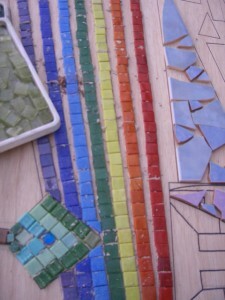 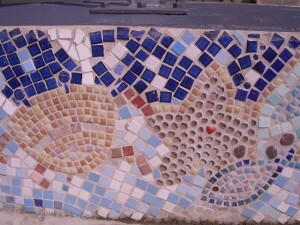 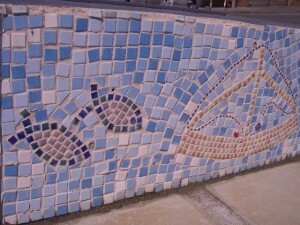 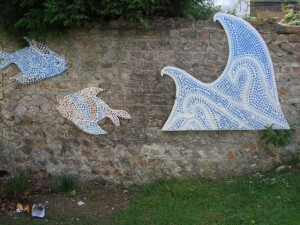 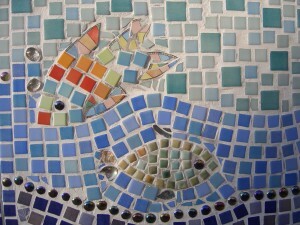 Designing and making a mosaic for the wall of the village Library was one of these projects. 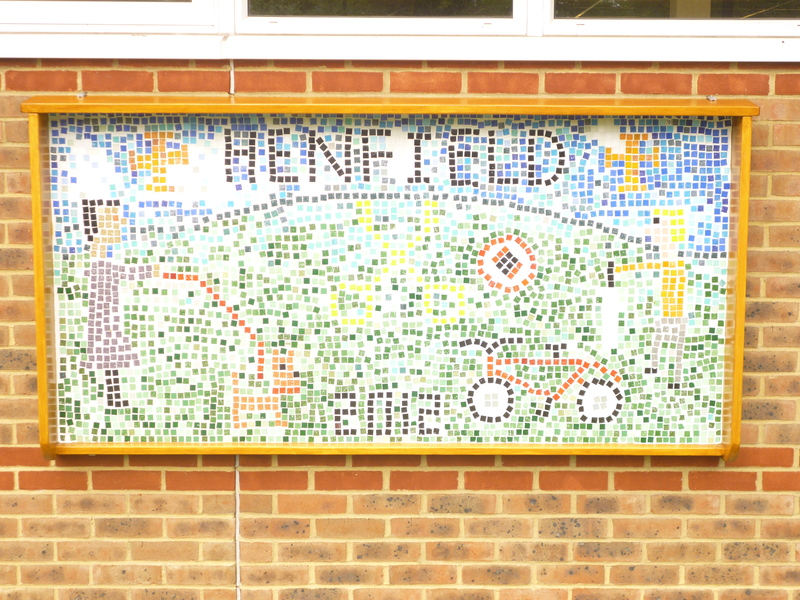 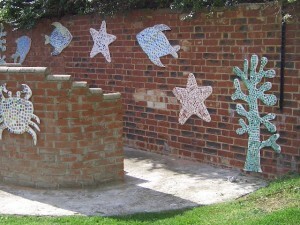 The mosaic was designed by pupils at Henfield Primary School for the outside wall of Henfield Library and planned so that it involve local residents. 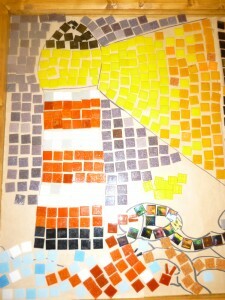 It was made on a paved area outside the Library with all pupils attending the workshops in groups. 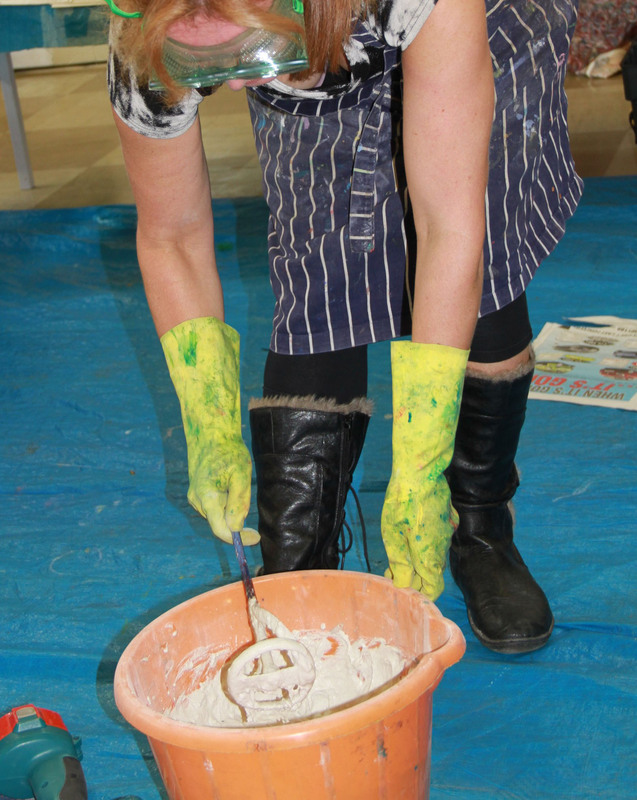 The local resicents were invited to take part and get involved in working with pupils from the school. 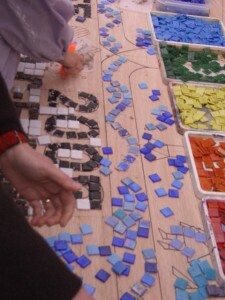 The making moved inside when the rain started to fall. 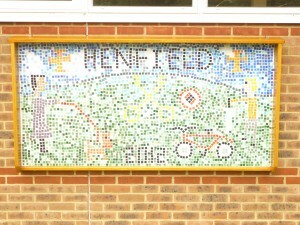 A commemorative mosaic was also made by pupils at Henfield Primary School. 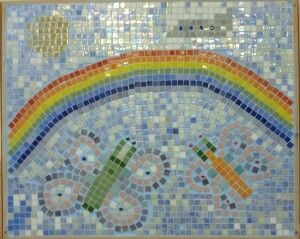 It was made in memory of a much loved member of the teaching staff who sadly passed away following her fight against cancer. 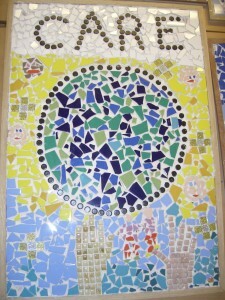 The thought and care that went into the making of this mosaic was done with such love and care with all pupils showing a very positive attitude. 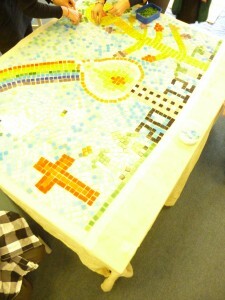 Little Horsted C of E Primary School centenary mosaic made in 2005. 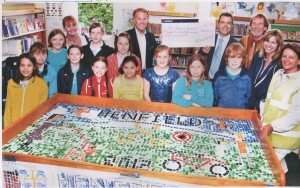 The making included all pupils, teachers, support staff and the Govenors. St. Peters Infant School, Portslade 2011. 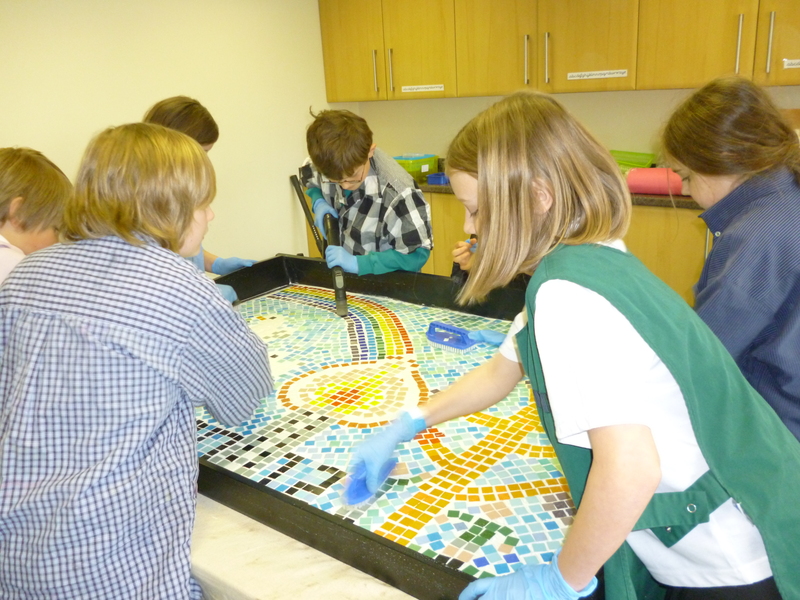 Mentoring groups of pupils with a mosaic project can be a significant and long lasting social and confidence boosting experince for pupils who may find some aspects of school difficult. Communication skills are boosted and a long lasting sence of achievement can be reached. 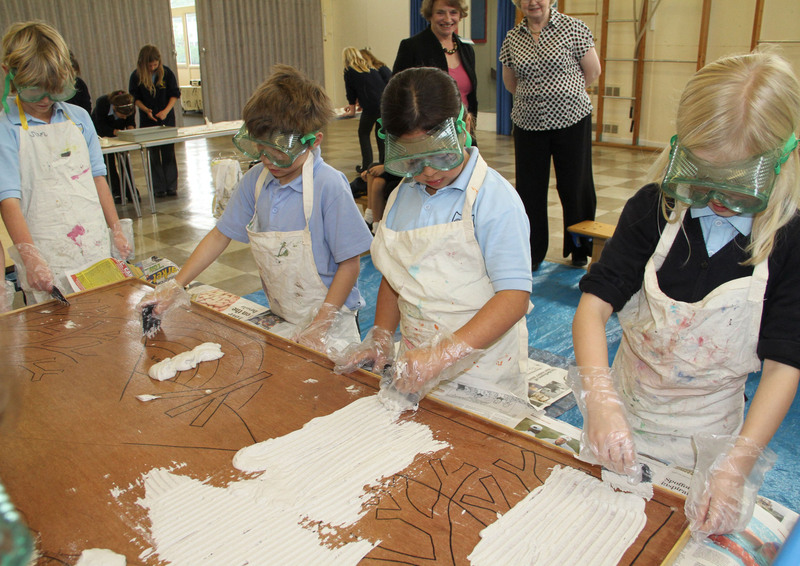 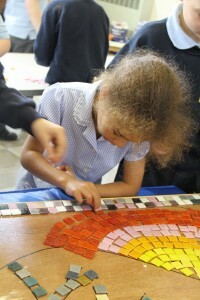 Pupils from the Junior school council were involved in the first school mosaic made with Art Techniques. 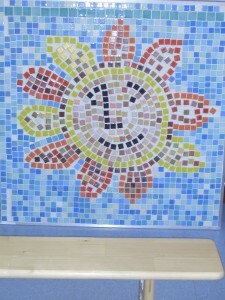 This included the school logo for the mosaic design. 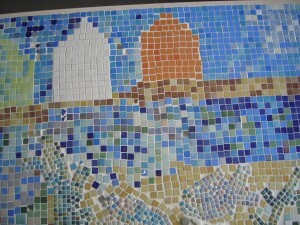 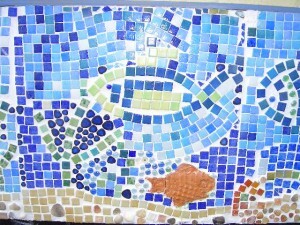 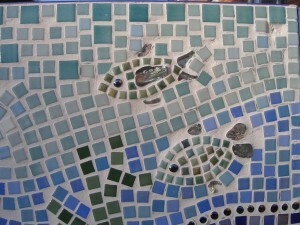 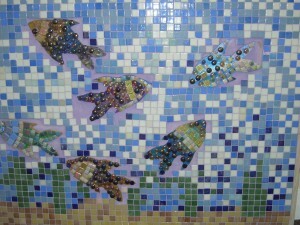 Pupils made a underwater mosaic for the school hall at Grays Infant School. 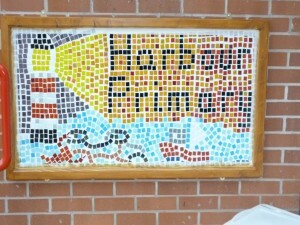 South Down Primary School has recently merged with Grays Infant and Nursery School to become Harbour Primary School. 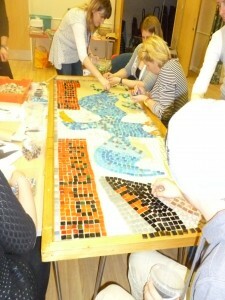 Staff from both sites attended an Inset Traing Day in Jan 2013 which included making two mosaic with Art Techniques. 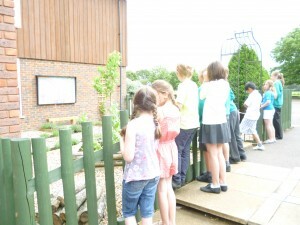 Pupils finshied off the projects the staff had started. 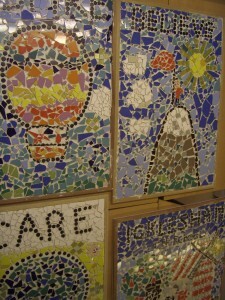 Both mosaics now hang outside the school buildings at the Western Road and Church Hill sites. 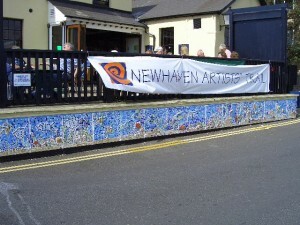 A number of funded projects went on display at the Ark, West Quay, Newhaven. 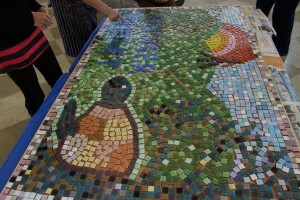 The first ever mosaic project with Art Techniques was made by experimenting with the process incorporting 15 individually decorated panels totalling 30 feet. 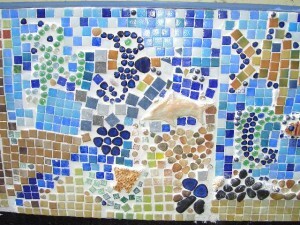 The panels included fired clay sea creatures. 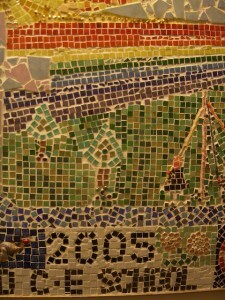 The mosaic lasted 10 years. It was hand stuck and involved infant aged children. 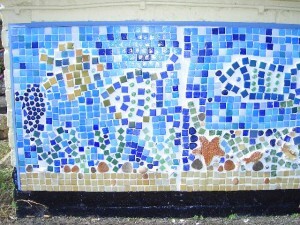 As no maintnance to the frame was undertaken by the owners, sadly this mosaic has now been taken down due to salt water and rain getting behind the panels due to lack of maintanance. 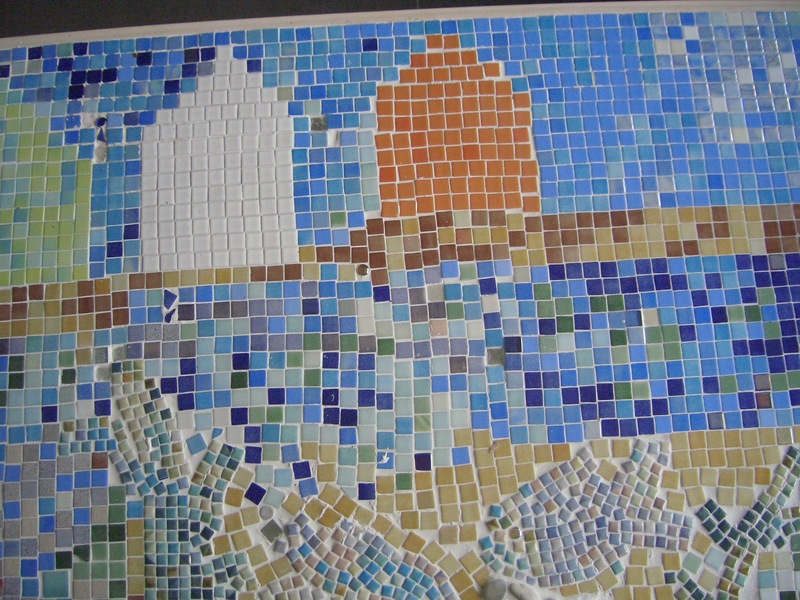 The wall mosiac was the largest project to date for Art Techniques. 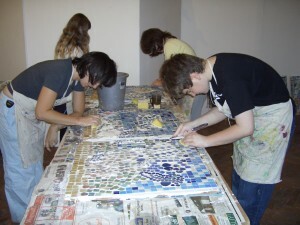 Involving all students from Start Art and Smart Art classes for 5-18yrs. 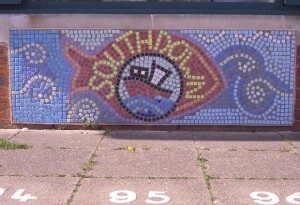 The projects were part funded by NCDA and the Pub Land Lord. 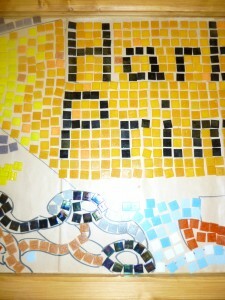 A lot was learnt about the process which guided subsequent projects. 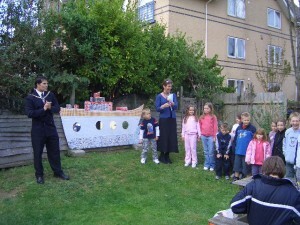 The groups went on to make a boat and under water sea shapes for the beer garden with the then Major, Robert Robertson making the certificate presentation. 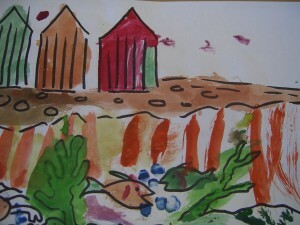 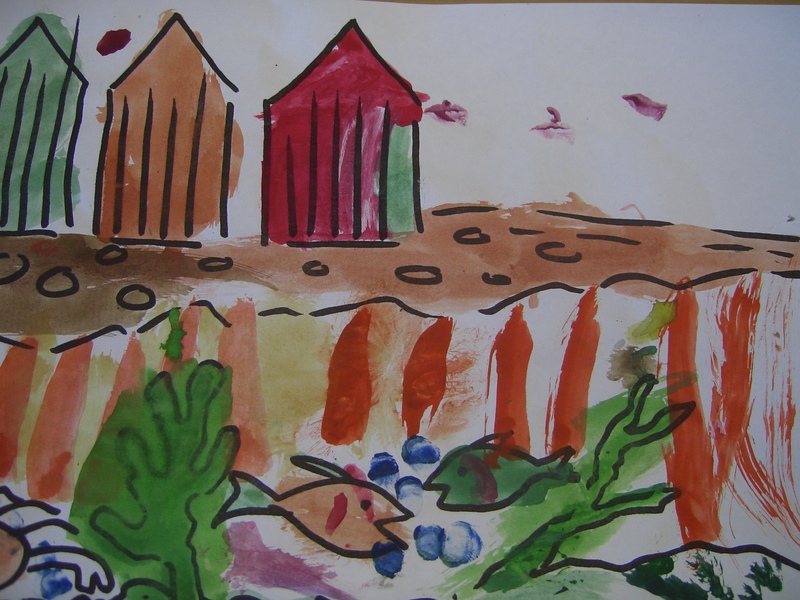 Children aged 3- 5 years made paintings and collages based on an underwater topic. 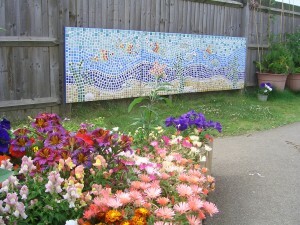 Carol Havard translated the work into a mosaic design for the Denton Island Community Centre Garden. 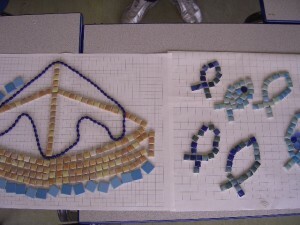 Pupils entered a design competition. 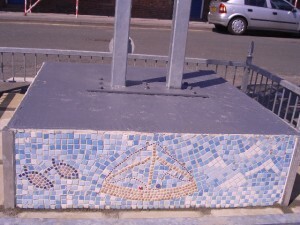 The winning designs were made into a new mosaic for the base of the site where the town War Momorial once stood. 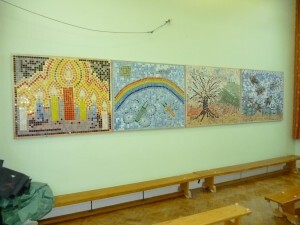 Four individual mosaics were made by year 4 pupils to be displayed in the school hall. 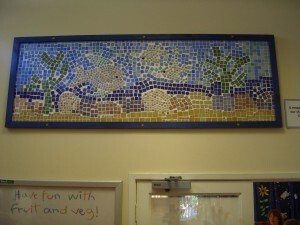 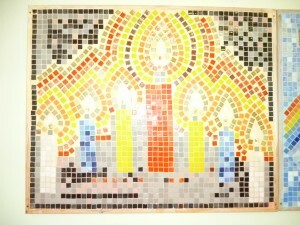 This stunning mosaic was made with tiles donated by parents. 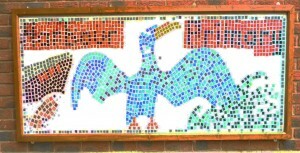 The National Association of Fine and Decorative Arts (NASFAD) part funded this striking school emblem. 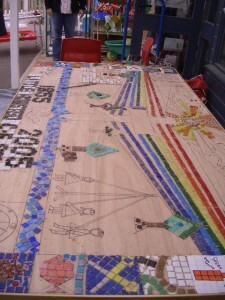 A week long project involving drawing , painting and collage aided the design for the making of mosaics for the school playground. Pupils learnt alot about materials and team work. 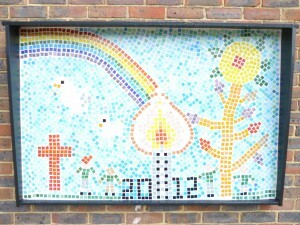 The school motto was incorporated into the mosaic panels. 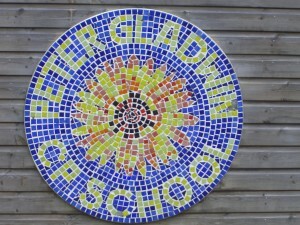 This mosaic still hangs outside Peter Gladwin. 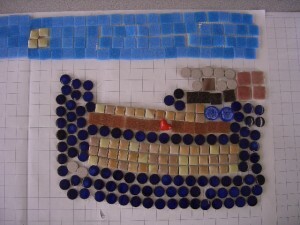 Drawings become mosaics inthis panel from St Mary Star of the Sea year 2 project funded by Creative Partnerships. 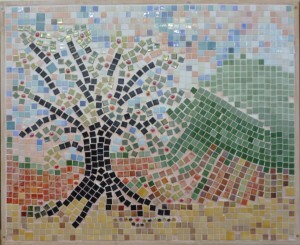 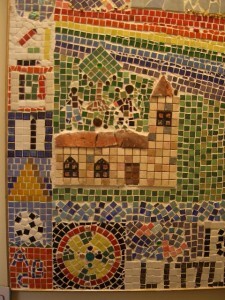 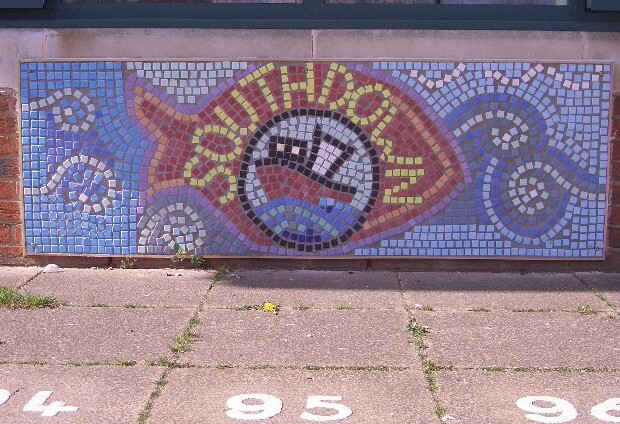 The gallery below shows you photos of school and community mosaic projects that the Art Techniques Service has facilitated.